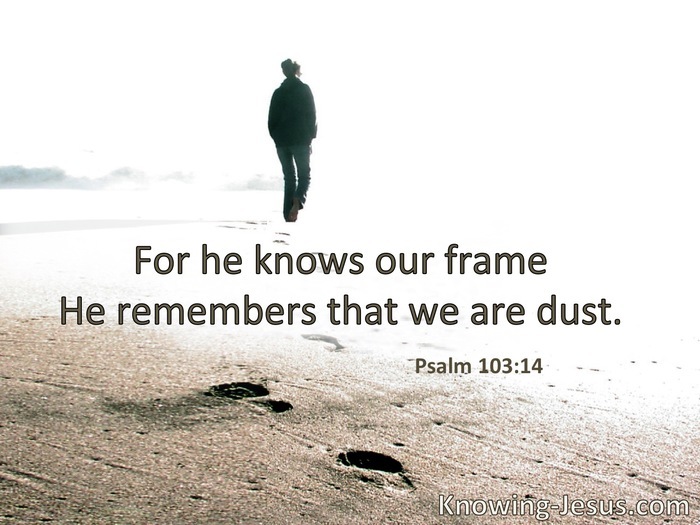 He knows our frame; He remembers that we are dust. The Lord God formed man of the dust of the ground, and breathed into his nostrils the breath of life; and man became a living being. I will praise You, for I am fearfully and wonderfully made; marvelous are Your works, and that my soul knows very well. My frame was not hidden from You, when I was made in secret … Your eyes saw my substance, being yet unformed. And inYour book they all were written, the days fashioned for me, when as yet there were none of them. Have we not all one Father? Has not one God created us? § In Him we live and move and have our being. § As a father pities his children, so the Lord pities those who fear Him. He, being full of compassion, forgave their iniquity, and did not destroy them. Yes, many a time He turned His anger away, and did not stir up all His wrath; for He remembered that they were but flesh, a breath that passes away and does not come again.